We all have our favorite kitchen tools, the ones that make our lives easier and produce exactly the results we are looking for. They make us feel like culinary superstars — like Alton Brown, Michael Symon or Alexandra Guarnaschelli. They are our very own sous chefs, our personal assistants that make the job easier. Read the reasons why I just love my Weston #8 Commercial Meat Grinder up on WomensOutdoorNews.com. Thanks to the Weston grinder I can get creative with wild game sausage recipes. I have made some of Hank Shaw’s recipes and even experimented with a couple of my own like an apple mead venison sausage and an asian inspired recipe. The possibilities are limitless and talk about a way to elevate a sausage and eggs breakfast! Add your favorite venison sausage to a skillet set on medium heat. Use a spatula or wooden spoon to break up the sausage into crumbles as it cooks. Once browned, remove from the pan and if your sausage is greasy, place on top of paper towels to absorb fat. Separate egg whites into a bowl. Add two more eggs and whisk. Return the skillet to the stove (medium heat) and add olive oil. Once heated add the eggs and scramble. 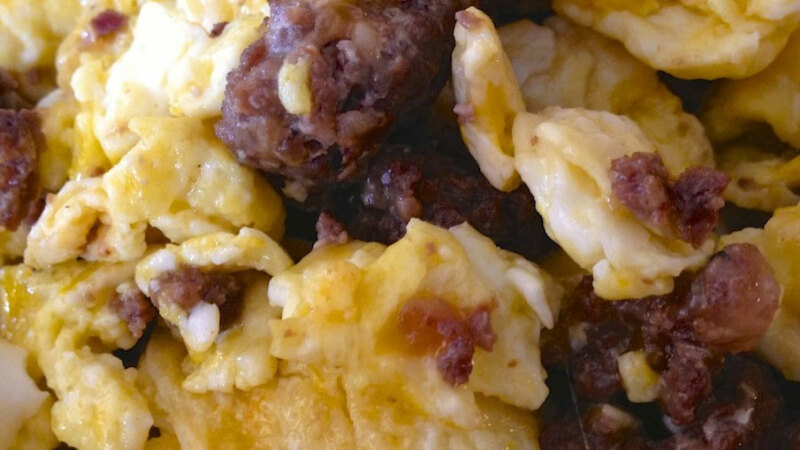 When the eggs are firm add the sausage and cheese to the skillet, stir and cook until the cheese has melted. Read Julie's review of the Weston Products #8 Commercial Meat Grinder. She used this grinder to make Hank Shaw’s Garlic and Basil Venison Sausages. For more wild game recipes, visit JulieGolob.com.